It's Gotta Be Monday – Workplace Fax Fails! Everyone in the workplace knows his name – Murphy, and they also know his law. It seems that it always kicks in at the worst moments, especially when it comes to expensive office equipment – like the ever-present fax machine. Jammed paper, pages printed entirely in black, or even refusal to send a file – we've all been there, wanting to go Office Space on them. Rather than fetching your bat, check out these humorous failings (and victories!) over one of the common irritants of the office, the ever-present fax machine. Contrary to popular belief, smacking it a few times will not always fix it. Or maybe he was just upset over the cost of toner and ink. We'll never know, because the fax machine won out in the end of this battle! Although many workplaces have made the transition to online faxing or email, fax machines still populate offices nationwide. Not all techies are happy with this though, as seen here. Apparently they prefer to be able to send messages at faster than 88 MPH, or maybe this particular machine required more than 1.21 gigawatts. In any case, they'd probably be happier with a TARDIS if the Delorean idea doesn't work out. 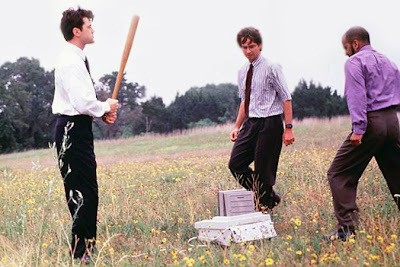 Harmless pranks are always good fun, and even more so when you cross a fax machine with a shredder! New trainees at an office are asked to fax over some important contracts...and then the fun starts. Thanks for the Compliment! Working in an office can be tough, and even stressful at times. 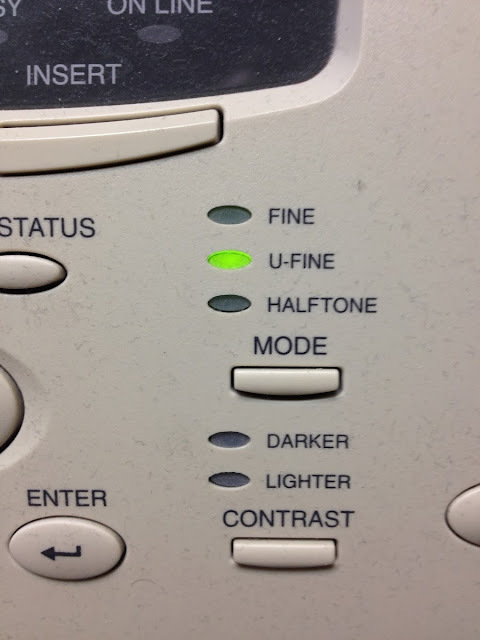 But don't worry, Friendly Fella Fax Machine's there to compliment you and make your day a little bit brighter. An office worker complained to their IT department that faxes weren't working correctly, and that she couldn't receive new ones. The technician that arrived checked over every port, all the settings, and couldn't figure out what was wrong. Finally, at a complete loss, he decided to check inside, and open the paper tray, thinking there might be a jam. 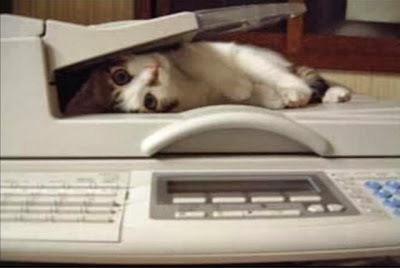 Perhaps this kitty was wanting to get in on all these CAT scans that he heard people talking about, or he just wanted to get the straight “fax” on things. Either way, this is a good argument against Take-Your-Pet-to-Work-Day – you just may end up faxing a hairball instead! Sending a fax from Gmail, Yahoo!, Outlook or Thunderbird sounds like a tech dream come true, right? No toner, no pterodactyl noises and no busy signals! 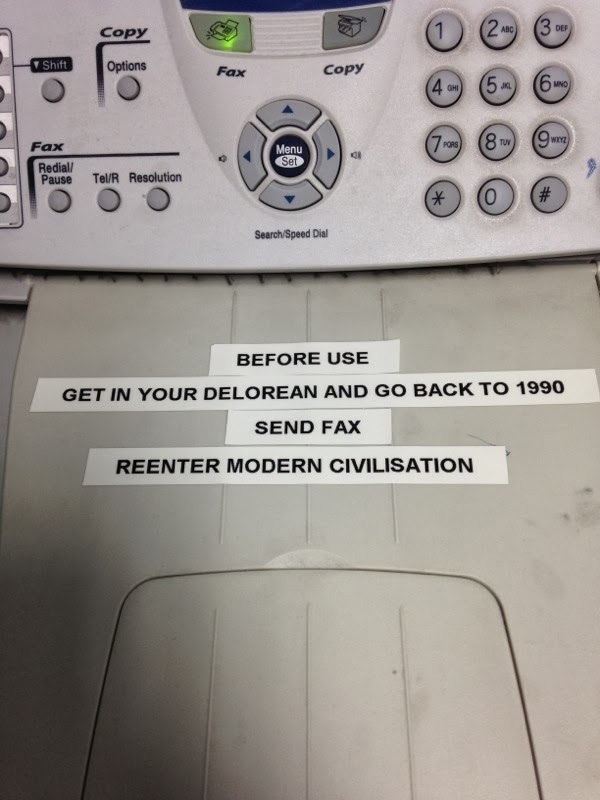 Here's how to send a fax by email using Fax87. The video above demonstrates how easy it is to send a fax from Gmail using Fax87. By following the steps below, you can fax by email from any email application, including iOS and Android mail apps. Enter a subject. This will become the title of the cover page. Enter a message body. This will become the fax cover page. Within a few moments, you will receive a confirmation email informing you of the success/failure of your transmission, the total pages sent, the transmission time and more. Keep in mind, you can send a fax from your iPhone, iPad, Android device or other email enabled device using the same method described above, giving you unmatched faxing flexibility. Sign up for a free 15-day trial of Fax87 today! Next to the printer, the fax machine is often the most maligned office device. Even the U.S. Department of Defense feels traditional faxing woes. MuckRuck, a public records request service, reported that their recent (faxed) Freedom of Information Act requests came back as undeliverable. Is the DoD out of cash? Not exactly. Since the MuckRuck story broke on September 12th, there's been a lot of speculation as to why the DoD (whose annual budget is more than $400B according to Bloomberg) can't afford a new fax machine. Turns out, they can. Aaron Grave, the the OSD/JS FOIA team chief, cleared up the details for U.S. News and World report two days later. "I simply said that if one (a new/replacement fax) was not currently available, we might have to wait until the start of the next fiscal year ... That is not due to lack of funds. ... [W]e were only made aware of the issue last week and are working to get it resolved as quickly as possible." The DoD's fiscal year starts on October 1. Hey DoD, maybe it's time to try online faxing! UPDATE 9/20/2013: Reports are coming in that the DoD has found a fax machine! Online Faxing Made Easy and Affordable ... with Fax87! Looking for an online faxing solution that's easy to learn, mobile device friendly and affordable? Then Fax87 is the choice for you! Check out the video below for a fun introduction to online faxing with Fax87. With Fax87, there's no software to install. You can send and receive faxes from anywhere on almost any device with an internet connection. 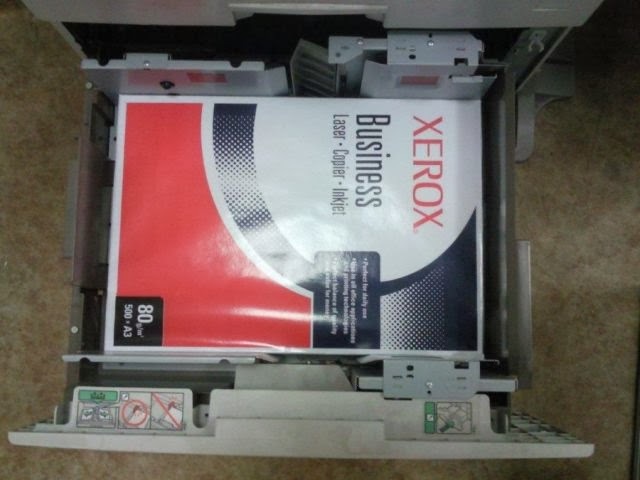 And best of all, Fax87 is one of the most affordable online faxing solutions available. Sending a fax with Fax87 is a breeze. Send to a single or multiple recipients with just a few clicks. Even international online faxing is no sweat for Fax87! Check out our how to send an online fax video below. Receiving faxes with Fax87 is simple too. Faxes are sent to the primary email address in your account profile as a PDF attachment. Best of all, faxes are kept in your online account so you can access them anytime, from anywhere! Check out our how to receive an online fax video below for a demonstration of Fax87 in action. Ready to sign up? Great! Please visit Fax87.com today and select the online faxing plan that works best for you or call 1-866-698-4068 today. Fax87 is pleased to announce that we have recently acquired WiredFax! We're delighted to welcome WiredFax customers to the Fax87 platform, one of the least expensive and most flexible online fax services available today. Our 24/7 customer support team is ready to answer any questions you might have about our service. Just go to Fax87.com and click Live Support in the upper right corner. 24/7 live support included with every subscription! Have your seen our latest online faxing infographic? While fax machines fade into obscurity, online faxing is growing by leaps and bounds. While fax machines have failed to evolve into Internet connected devices, faxing itself has changed with the times. First with hardware / software combinations (desktop scanners and telephone modems) and now with digital document transmissions sent via the Internet. Faxing in entrenched in modern business, especially where record keeping and physical signatures are of the utmost importance. Having a "paper trail" is still relevant in many office environments. Others simply enjoy the added peace of mind of having an analog backup to their digital file storage. View the Fax.87 online faxing infographic. Fax.87's online faxing infographic featured on Yahoo! Our online faxing infographic was featured twice on the Yahoo! network this month. Both articles do an excellent job of detailing the relevancy of faxing today as make excellent cases for the continued use for faxing in industries such as healthcare and legal. Fax87.com is one of the easiest and most affordable online fax services available today. Please sign-up for our free 15-day trial and feel free to let us know what you think about our service in the comments below. We welcome your continued feedback so that we can make our product more robust and even easier to use in the months and years to come! Electronic fax services are great for a business on-the-go. Often, traditional faxes come out smudged or illegible because of the transfer process and become virtually unusable to the professionals counting on them. An unreadable document becomes a mere waste of money and paper when it can't be filed or counted upon for accuracy. In an office or business, an inaccurate interpretation of information can lead to everything from insufficient supplies to misconstrued medical records that could potentially kill someone. You can get around the problem by getting help from a faxing service. With an electronic fax service, you can download clean documents from files on your computer that are easy for the recipients to read. Not only that, but you can send the documents much more quickly, get easy confirmations of what you are sending, and get a timestamp on your account that allows you to prove when you sent a particular fax to a particular person. With the ability to send accurate and clear real-time faxes to co-workers and clients, you will have much less trouble getting work done and be much less likely to encounter or have to fix errors. With an easy and clear fax system, you don't have to waste time wrangling with the fax machine and hoping that it feeds the paper right or that it went through correctly. In the end, electronic fax services are the best thing for the modern business. With the new technology provided by the Internet, an electronic fax service makes errors and smudges a thing of the past and makes your job easier and more efficient. Copyright © 2009-2011 Fax87.com. All rights reserved.